Habit: Annual to tree, glandular or not. Leaf: simple to palmately or pinnately compound, generally alternate; stipules free to fused (0), persistent to deciduous. Inflorescence: cyme, raceme, panicle, cluster, or flowers 1; bractlets on pedicel ("pedicel bractlets") generally 0--3(many), subtended by bract or generally not. Flower: generally bisexual, radial; hypanthium free or fused to ovary, saucer- to funnel-shaped, subtending bractlets ("hypanthium bractlets") 0--5, alternate sepals; sepals generally 5; petals generally 5, free; stamens (0,1)5--many, anther pollen sacs generally 2; pistils (0)1--many, simple or compound, ovary superior to inferior, styles 1--5. Fruit: 1--many per flower, achene (fleshy-coated or not), follicle, drupe, or pome with generally papery core, occasionally drupe-like with 1--5 stones. Seed: generally 1--5 (per fruit, not per flower). Genera In Family: 110 genera, +- 3000 species: worldwide, especially temperate; many cultivated for ornamental, fruit, especially Cotoneaster, Fragaria, Malus, Prunus, Pyracantha, Rosa, Rubus. Note: Number of teeth is per leaf or leaflet, not per side of leaf or leaflet, except in Drymocallis. Scientific Editor: Daniel Potter, Thomas J. Rosatti. Fallugia paradoxa (D. Don) Endl. ex Torr. Habit: Shrub < 2 m, +- erect. Stem: much-branched; bark gray-white-tomentose, peeling. Leaf: alternate to clustered, 7--15 mm, ovate to wedge-shaped, deeply 3--7-pinnately lobed, lobes linear, obtuse, densely hairy adaxially, rusty-scaly abaxially, margins rolled under; stipules lanceolate, deciduous. Inflorescence: flowers 1--3, terminal; pedicel bractlets 0. Flower: hypanthium hemispheric, silky-hairy, bractlets 5, linear; sepals 5--8 mm, ovate, acute to long-acuminate, tomentose; petals 10--25 mm, +- round, white; stamens many; pistils many, ovary superior, chamber 1, style 1, persistent. Fruit: achene, 3--5 mm, silky-hairy, style 30--50 mm, plumose, +- purple. Chromosomes: 2n=28. Citation for this treatment: Bruce D. Parfitt & Margriet Wetherwax 2012, Fallugia paradoxa, in Jepson Flora Project (eds.) 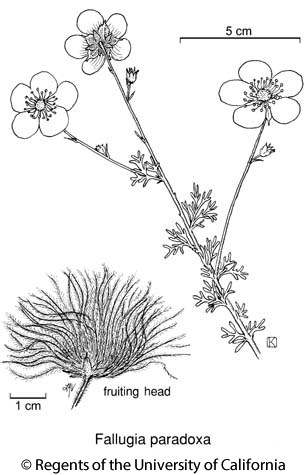 Jepson eFlora, http://ucjeps.berkeley.edu/eflora/eflora_display.php?tid=25756, accessed on April 19, 2019.
e DMoj; Markers link to CCH specimen records. Yellow markers indicate records that may provide evidence for eFlora range revision or may have georeferencing or identification issues. Purple markers indicate specimens collected from a garden, greenhouse, or other non-wild location.